If you're a fan of cooking (or eating), you likely have a large collection of kitchen utensils at home. Whisks, spoons, spatulas, and knives jammed into a drawer so tightly they often arrange themselves to jam the drawer. Sound familiar? What if we told you it was possible to bring all your favorite cooking utensils along on your outdoor trips? With the Destination Kitchen Set, you can. This compact 24 piece set includes every utensil you need for a gourmet meal no matter where you are. 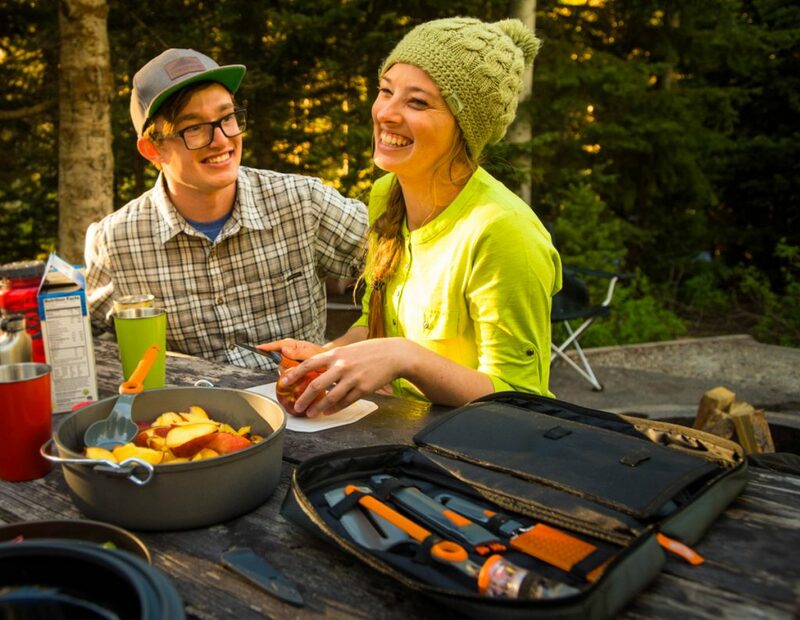 Weighing in at under 2 pounds, this set folds neatly into a compact carrying case - making it perfect for meals in the camper, group dinners on the river, or fireside mornings at base camp. Unzip that tote, let's see what's inside. What? A cheese grater on your camping trip? While we do believe in roughing it on your outdoor adventures, we don't think your cuisine should suffer. This mini grater is lightweight and minimal but grates with the best of them. Go ahead - garnish your dish with a little freshly grated cheese or use on a garlic clove for minced garlic without the mess. Perfect for potatoes, carrots, or whatever food item you need to be easily rendered into small pieces. This meal just got grate. Did you think whisks aren't travel ready? Think again. This isn't your ordinary whisk, this is the Collapsible Whisk - weighing 1.2oz and collapsing down to only 6.5in long, this unique whisk design means this whisk can reach the corners of any camp cookware while being easy to clean an indispensable to a camp chef. Your scrambled eggs will taste even better than they do at home. The serving spoon and spatula - likely the biggest drawer hogs in your kitchen. How did we make them travel friendly, you ask? We pivot. The Pivot Spoon and Pivot Spatula have 180 degree rotating handles, cutting their size in half and easily storing away in the Destination set case. Easily turn from storage to serving in seconds, with reinforced handles to prevent mishaps from heavy loads. Go ahead - scoop all the soups, flip all the pancakes. Though not limited to only salt and pepper, this mini shaker will be your camp cooking best friend. Modules screw together to keep spices dry and fresh, with an easy filling cap. Sprinkle on a little or a lot, then store away for the next adventure. No meals left bland at this campsite. Available only in this kitchen set, the small-but-mighty utility knife is all you need for slicing, dicing, chopping, or carving. Serve you camp guests meals that are a cut above - you might just slip this one in your home knife drawer when no one is looking. Sold separately as the Ultralight Cutting Board, this thin and sturdy cutting board slips into the kitchen set with ease - you won't even know it's there until you need it. Flexible design means you can slide your chopped goods into the pot with ease, and meat and vegetable icons on the reverse sides of the board prevent contamination. On top of all the cooking pieces, this set also boasts four full sets of cutlery. We wouldn't want you to whip up a gourmet camp meal without being able to enjoy it, so pass around the knives, forks, and spoons and dig in. Last but not least, the items that do most of the work: the scrubber and camp towel. Easy to use pot scrubber helps remove even the toughest dried foods, and the towel cleans up messes and dries your dishes trip after trip. Two soft sided condiment bottles also stow away in this jam-packed kitchen set. Easy to squeeze and refill, these bottles have tethered lids to prevent dropping lids off a cliff or into a ravine (it happens more than you think). Fill with oil, ketchup, vinegar, lemon juice, dish soap, whatever liquids your recipes call for - just make sure to label them on the writable date bar so you don't get your contents mixed up. This kitchen set packs every piece you might need for a delicious camp meal into one simple case. If you only bring one thing to your campsite for food preparation, grab this set and get on the road knowing delicious food lies ahead.